Whether you’re getting married or prepping for a divorce, you need to make certain financial decisions when you do your taxes. 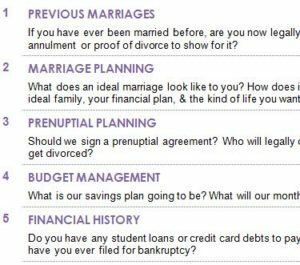 The free Divorce Financial Checklist is a template that can show you the important items to consider when getting a divorce or if you’ve just been married. Many couples don’t consider these important financial items until it’s far too late. The document gives you the power to check off these items and ensure your future is secure, no matter what path you follow. To use the template today; just follow the link at the bottom of this page. Once you have the free template document downloaded and open on your computer, you’ll see an entire list of items displayed on the page. You can print this template by clicking the “File” button at the top of the page and selecting the “Print” option from the drop-down menu that follows. Start at the top and check off items that apply to you. For example, if you have previous marriages, you would enter a checkmark in the box to the right of the item listed. When you have completely gone through the list of items on this template, it’s time to go back and evaluate the steps you need to ensure your financial future. Below each item of the template is a helpful piece of advice that applies that item. Going back to the “Previous Marriages” item, it states that you should have proof of your divorces when you’re filling out your taxes. Take the advice provided by the template into consideration when you’re doing your taxes this year. Marriages and divorces can be tricky to handle but the Divorce Financial Checklist ensures you have all the tools you need.